Protect your home and health: Eliminate airborne pollutants. 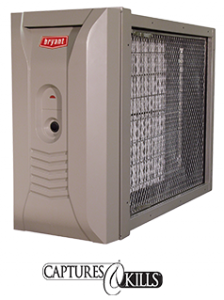 The ultra-reliable Bryant® Perfect Air™ Purifier with Captures and Kills™ technology protects your indoor air with the same effectiveness as systems used in many hospitals and government facilities. Designed to complement most furnace-based comfort systems, it’s a smart choice for those especially sensitive to airborne pathogens. Indoor air is re-purified, not just filtered, as often as 8 times each hour.